Instance of SCP-3223-2β, at rest on Researcher ████████'s hat. Special Containment Procedures: SCP-3223 currently resides in a specialized refurbished greenhouse containment unit, located in the botanical facilities section of Site-17. Access to this greenhouse requires Level-3 authorization; recurring visiting rights may be granted via written permission from the site director. SCP-3223-1 is allocated all of the gardening space within the greenhouse for use in its rituals, with at least 20 square meters of outdoor land plots set aside to be available upon specific request. Additional materials for SCP-3223-1’s funerary rites and structures may be provided at the discretion of the project director. A comprehensive list of materials and items allowed in SCP-3223’s containment is on file and requires Level-2 authorization for access. SCP-3223-2 cannot be physically contained, and are allowed to accompany SCP-3223-1 during its daily routine. A count of the beetle population is to be done twice daily. Foundation personnel must receive authorization from the project director (currently, Dr. Mark Kiryu) prior to initiating interaction with any instances of SCP-3223-2. Should any SCP-3223-2 instances approach a personnel member and emit vocalizations, said personnel member is to allow the action and write up a detailed account of the encounter, then submit the notes to the project director for review. Foundation personnel who wish to offer deceased pets to the SCP-3223 project may submit a request form to any Level-2 researchers assigned to SCP-3223. Description: SCP-3223 is a collective designation referring to a humanoid entity (SCP-3223-1) and its anomalous entourage of incorporeal dung beetles (SCP-3223-2). SCP-3223-1 appears to be a human of indeterminate race and intermediate age, possessing eyes with scarlet pupils. SCP-3223-1 has no body hair, and does not appear to age. The attire SCP-3223-1 wears is believed to be permanently affixed to its body, and consists of plant-fiber sandals, a long white linen robe with a shoulder strap, and linen cloth wrapped around the arms. SCP-3223-1 is able to access a functionally limitless supply of linen strips of various widths from its arm wraps, and has additionally demonstrated the ability to produce a substance identical in chemical makeup to Commiphora myrrha resin from its fingertips. SCP-3223-1 is docile by nature and seems to understand speech in all languages used to address it; however, it refuses to speak out loud, and instead communicates using simple gestures. 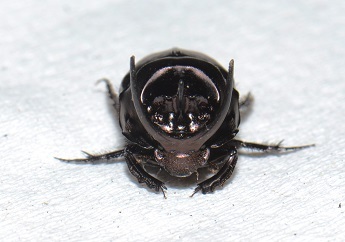 SCP-3223-2 instances outwardly resemble dung beetles of the Scarabaeus sacer species1. SCP-3223-2, though they appear solid, are intangible and cannot be physically interacted with. SCP-3223-2 instances will nevertheless respond to human individuals as well as SCP-3223-1, including attempting to crawl on limbs and torsos, moving out of the way of incoming motions, and perching on the highest point of a human in an unmoving relaxed pose. SCP-3223-1’s primary anomaly involves creating instances of SCP-3223-2 from the remains of deceased domestic animals. As such, the secondary sub-designations SCP-3223-2α and SCP-3223-2β were created to refer to the SCP-3223-2 instances initially discovered with SCP-3223-1, and the instances created after Foundation containment, respectively. When presented with a suitable2 deceased animal3, SCP-3223-1 will cover the remains in a layer of resin produced from its hands, and carefully wrap the body in linen bandages pulled from its arms. SCP-3223-1 will then proceed to whisper to the mummified animal, and at the conclusion of these vocalizations, an autonomous instance of SCP-3223-2 will manifest, appearing to crawl out of the bandaged remains. It is believed that this ritual is similar to the sacred rites used by Ancient Egyptian priests to endow scarab beetles with the power to spiritually guide the souls of the deceased through the underworld, by providing answers to riddles whispered to the beetle prior to its death. The mummified animal remains will be interred by SCP-3223-1 in the nearest plot of land available, and depending on the species of animal, provided with additional funerary rites4. SCP-3223-1 will refuse to engage in this ritual if any humans, recording equipment, or non-feline animals are within viewing distance. It is noted that while SCP-3223-2β instances vary widely in appearance, all SCP-3223-2α instances are the uniform black color of non-anomalous dung beetles. Additionally, SCP-3223-2α instances will readily approach any personnel, while SCP-3223-2β instances will only interact with SCP-3223-1 and the original owner of the deceased pet used to create the instance. Addendum 3223-1: Although SCP-3223-1 does not speak, instances of SCP-3223-2 have been observed to emit understandable vocalizations, which can be heard clearly by listeners regardless of primary language. These vocalizations are heard in a low-pitched voice, only discernible when an SCP-3223-2 instance is allowed to hover directly next to an individual’s ear or when perched on the individual’s shoulder. Following a series of experimental trials to ascertain the content of the vocalizations, it was determined that SCP-3223-2α instances “recite” portions of spells listed in the Ancient Egyptian Book of the Dead5. However, SCP-3223-2β instances emit vocalizations that are noticeably less coherent, containing phrases that are not present in the Book of the Dead (see partial log of SCP-3223-2β vocalizations below). entire beetle appears to be covered in smooth fur. Proposals are underway for further experimentation, to discern level of intelligence in SCP-3223-2 and a potential means of determining what each individual SCP-3223-2 instance considers significant enough to vocalize. Addendum 3223-2: It came to Foundation attention that SCP-3223-1 would consistently appear disappointed with new instances of SCP-3223-2β, especially in the event of a beetle that produced particularly garbled vocalizations when deceased mammals were used for the ritual. For experimental purposes, Dr. Mercer volunteered to adopt a grown male scarab beetle from a hobbyist group and raise it as a pet; six months later, SCP-3223-1 was presented with the deceased beetle6, a live scarab, and a deceased scarab from a preserved insect collection. SCP-3223-1 performed its standard ritual process on "Gandalf", ignored the deceased specimen beetle, and began to care for the living scarab beetle as a pet. Currently, said beetle has not exhibited any unusual traits, aside from always remaining close to SCP-3223-1. The SCP-3223-2β instance created from "Gandalf" was noted to appear almost identical to SCP-3223-2α, and could speak Book of the Dead spells in unusually fluent speech. Of note, the "Gandalf" SCP-3223-2β instance would always conclude its vocalizations with the specific greeting Dr. Mercer would use when Gandalf was alive and about to be fed or allowed outside his enclosure for exercise. Discussion has been raised suggesting that SCP-3223-1 be given a small colony of non-anomalous dung beetles to raise on its own. 1. These beetles feature prominently in Egyptian mythology and are often referred to as simply “scarab beetles”. 2. To date, SCP-3223-1 has refused to embalm animals that were not considered cherished pets, were deceased due to neglect or intentional harm, or did not possess a name. How SCP-3223-1 is able to discern these criteria is unknown. 3. In addition to standard domestic pets (cats, dogs, birds, fish, and reptiles) SCP-3223-1 has also mummified butterflies, two spiders, and a single cockroach. 4. While SCP-3223-1 tends to simply bury insects and mark the grave with a small stone, the entity treats cats and reptiles with particular attention, often laying a container holding a small portion of food near the grave if possible. A small stock of wet cat food has been provided to SCP-3223-1 for this reason. SCP-3223-1 does not appear to identify dry cat food as an edible. 5. The Book of the Dead is a magical and religious text intended to help the dead pass through challenges to become worthy of entering the afterlife. Further study into SCP-3223's potential relation to SCP-911 is ongoing. 6. The beetle was named "Gandalf".